"The Cosby Show"'s Mrs. Huxtable, Phylicia Rashad – who directed last season's "A Raisin in the Sun" at the Kirk Douglas Theatre – helms August Wilson's historic drama. Set in Seth and Bertha Holly's Pittsburgh boarding house during the Great Migration in 1911, a revolving collection of characters takes shelter under their roof. In such a tentative time of change, the strangers share the commonality in their search for a new life. Running through June 9. Attention, all hockey buffs! The voice of the Los Angeles Kings shares 40 years of the ups and downs of L.A. hockey, as well as behind-the-scenes stories in his just-released book, Tales from the Los Angeles Kings Locker Room: A Collection of the Greatest Kings Stories Ever Told. Meet the sportscaster and have a copy of the book signed tonight at the Grove. For one night only, some of Madonna's most iconic fashion ensembles are on display alongside styles from her Material Girl junior line she created with her daughter, Lola. A few of the stand-out pieces for view are her Jean Paul Gaultier cone bra corset, her "Like a Virgin" wedding dress and the Christian Lacroix Reinvention Tour costume. No, there isn't anyone actually named Lydia in the Gilbert, Ariz.-based band, but the most pleasantly surprising fact you'll learn about the foursome is that, upon first listen, they will thoroughly captivate you. The 10 tracks on Devil, their latest release that was produced by Colby Wedgeworth (The Maine, Austin Gibbs, Lybecker), will quickly become the soundtrack for your every mood, and there's no doubt that their live performance should be just as enthralling. They also perform at the Constellation Room on Saturday night. If you didn't already know, we're in the midst of the seventh annual BritWeek, and who better to celebrate with than the London quintet, who just released their fourth album, Time Stays, We Go, earlier this week. The Veils actually recorded the full-length here at Seedy Underbelly Studios in Laurel Canyon, and it is said to mark the beginning of a new era for the band, combining two sides of their personality: "the Pop and the Snarl," as lead singer/songwriter Finn Andrews calls them. No better time to witness both sides of the group on display at the Echo. Fela Kuti was a multi-instrumentalist, composer and pioneer of Afrobeat music, as well as a human rights and political activist. 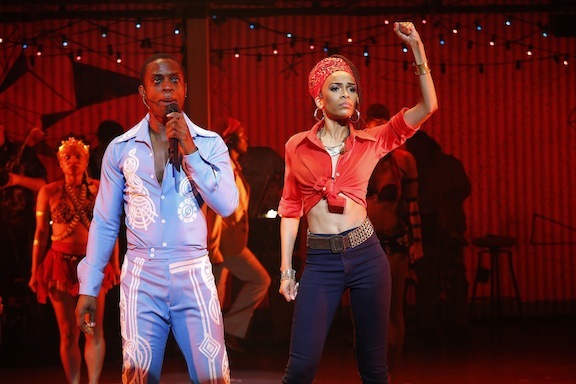 His captivating story is told in the musical presented by Shawn "Jay-Z" Carter, Will Smith and Jada Pinkett Smith and stars Adesola Osakalumi and Destiny's Child's Michelle Williams, with direction and choreography by Tony-winner Bill T. Jones. If you're a longtime Fela fan or interested to learn about the dynamic figure, this production will shake your body and your soul. Hurry and get your tickets, though, "Fela!" is only running through next Sunday, May 5. Since I'm an Eastsider, the third annual food and drink festival showcases some of my own personal neighborhood haunts. From the Park and Canelé to Hugo's Tacos and Mohawk Bend (see the Sad Robot interview there), most of my favorite restaurants are offering samples of their fare. And Juice Served Here, Silver Lake Wine, Golden Road Brewing, Intelligentisia Coffee are set to quench your thirst. The English director and screenwriter appears for a full evening of festivities at the Egyptian as part of Entertainment Weekly's Capetown Film Festival. First up is a screening of his 2004 zombie apocalypse comedy and one of the only 'scary' movies I actually love, Shaun of the Dead, starring Simon Pegg. Then Wright is joined by actors Jason Schwartzman and Mary Elizabeth Winstead and graphic novelist Bryan Lee O'Malley for a discussion before a screening of 2010's Scott Pilgrim vs. The World.